CloudSigma is proud to announce that it has partnered with Irish Managed Hosting & IT Services provider Servecentric to launch a Dublin-based Infrastructure as a Service (IaaS) platform, Servecentric Enterprise Cloud. Servecentric has more than 15 years experience providing Data Center solutions such as colocation, connectivity and managed IT services. The new collaboration with CloudSigma will further Servecentric to provide a state-of-the-art public IaaS to their customers out of their Dublin Data Center. Servecentric’s facility is a Tier 3 Data Center. It connects directly to the T50 metropolitan link. The Data Center supports different carriers including Verizon, Viatel, Vodafone, euNetworks, CenturyLink, Cogent, to name a few. Customers’ data will certainly remain safe with Servecentric’s proven record. The Data Center is backed by ISO 9001, ISO 20000, ISO 27001 and PCI-DSS certifications. “The feedback we have been getting from our clients is that hyperscale cloud offerings are becoming increasingly complex and difficult to cost control. Particularly, this is an issue in hybrid scenarios. Moreover, the requirement for additional support from third party partners or premium vendor services is significantly impacting the cost justifications for cloud consumption.” Brian Roe, Commercial Director @ Servecentric. The joint venture aims at serving the rapidly expanding Irish market with a flexible and customizable cloud deployment in Dublin. Thanks to the partnership with CloudSigma, Servecentric Enterprise Cloud has set out to be different on a number of fronts. For example, it will provide direct chat support, 24 x 7 x 365. The support is available for all clients, with an average response time of less than 30 seconds. The service also supports almost all Operating Systems and facilitates easy migration to and from the platform as required. Additionally, for hybrid deployments, Servecentric can provide ultra-low latency 1Gb or 10Gb backbone with no need for expensive carrier services or port connect charges. Powered by HPE’s High-Performance Computing “Apollo” family, the Servecentric Enterprise Cloud is set to deliver exceptional price/performance ratios, both from compute and storage perspectives and is in final testing phase now, with official launch set for 14th November, 2018. The new offering adds to CloudSigma’s unique value proposition which enables its services to be deployed across its network of cloud locations without any modifications required and without any change in the quality of the service. In addition, CloudSigma’s pay-per-use model provides customers the flexibility to deploy resources according to their unique needs. We’re also very happy to invite you to the Servecentric Enterprise Cloud launch event. 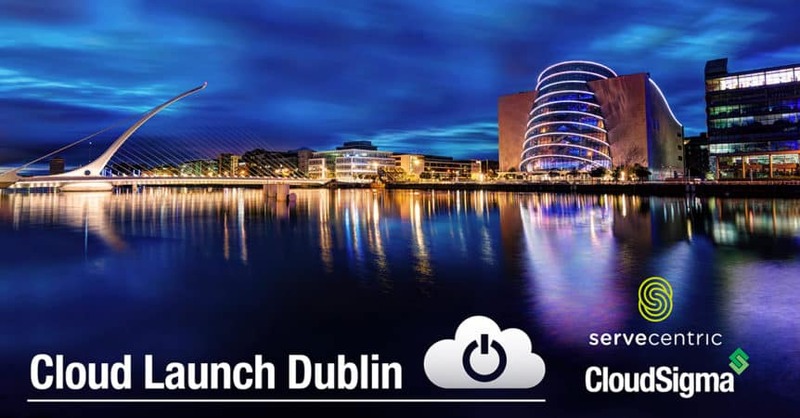 It is designed to introduce the new local Irish Cloud offering to Dublin-based businesses and potential partners. The launch will take place on November, 14 2018 at The Crowne Plaza Hotel Blanchardstown in Dublin. We will start at 8.30 AM. We have planned informative presentations, breakout sessions, live demonstrations and a tour of the Data Centre after the event! Join us to learn more about our unique offering and the chance to network with cloud computing experts and enthusiasts. CloudSigma is a pure-cloud infrastructure-as-a-service (IaaS) provider that’s enabling the digital industrial economy through its highly-available, flexible, enterprise-class hybrid cloud servers and cloud hosting solutions in Europe, the United States, Asia and Australia. CloudSigma is the most customizable cloud provider on the market. It gives customers full control over their cloud and eliminates restrictions on how users deploy their computing resources. With CloudSigma, customers can provision processing, storage, networks and other fundamental computing resources as they please. Customers can also extend private networks out of existing infrastructure and elastically into CloudSigma’s IaaS cloud to create easy to manage and transparent hybrid cloud solutions. For more information, please visit www.CloudSigma.com or find the company on Twitter, Facebook, LinkedIn and Google+. Servecentric is a premium Data Centre services provider based in Dublin. The company provides a range of colocation, connectivity, cloud and IT managed services for clients across the globe. The company is a registered ISP and offers highly available connectivity and security solutions for its Data Centre client base. Through its partnership with Cloudsigma, the company now can offer full end to end hybrid deployments under one roof. Servecentric operates to the highest international standards, ensuring business critical systems are available and protected, 24 x 7 x 365. Zhenya is a Digital Marketing Expert at CloudSigma, focusing on brand strategy, social media marketing and digital marketing campaigns. She is passionate about the continuous innovation within the digital environment and the endless growth opportunities that inbound marketing brings.